Puzzled 365-004, originally uploaded by Judi FitzPatrick Studio. 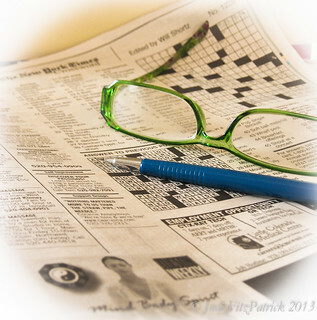 Working the crossword puzzle in the Tucson Weekly. I never left the house today, but worked on this puzzle a bit. All manual updates to this image, no presets used. Cropped, lightened, changed Sat and Lum, sharpened, added vignette, then watermark on export. I may be running out of LR editing changes I can make that are "new" to me. I hope you all have a wonderful weekend filled with joy and peace.